Not another dysfunctional Pay To Click (PTC) website. 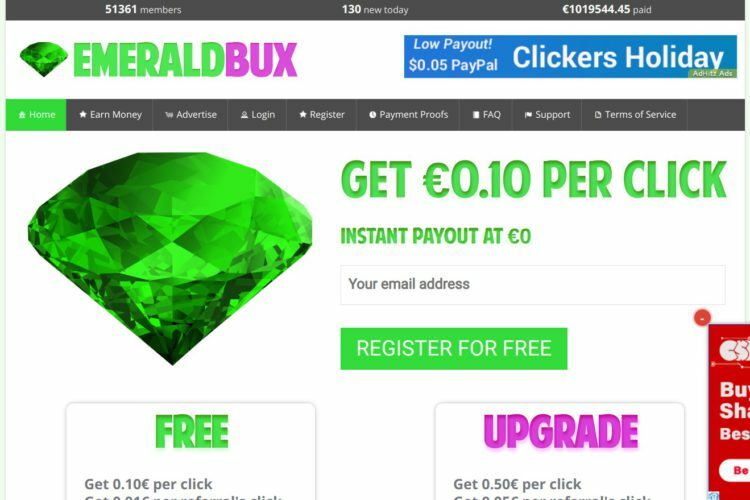 Emerald Bux – Get €0.10 per click. A while back I reviewed my first PTC site that goes by the unintelligible name of BrainBux. The irony is that EmeraldBux and BrainBux appear to be identical to each other. The same website layout and design, features, navigation and ad placements are spit image of one another. Only real significant difference is that BrainBux is red, while EmeraldBux is green. I admit Emerald Bux is the clear winner in terms of visual aesthetics and alluring branding. You know, there are actually many more of these PTC websites indexed in Google and lesser search engines. I’m looking forward to investigating many of these in the future. But right now Emerald Bux is the obstacle standing in the way. Quick question, how did you find out about EmeraldBux? I stumbled upon this by mere chance whilst skimming through Google Search Console (GSC) and spotted a keyword highlighting this term. Even though I had not made a single mention about this company before in any of Scam VS Legit’s reviews. It’s funny how GSC works sometimes. Great for giving new writing ideas. To get back on topic, let us discover if Emerald Bux is a Scam or legit. What are your first impressions of this busy platform? Emerald Bux is nothing more than a Pay To Click (PTC) platform that is designed to allure members into clicking on online banner advertisements, ad links, micro and nano ads. In doing so you can earn a small percentage of income from the clicks initiated. 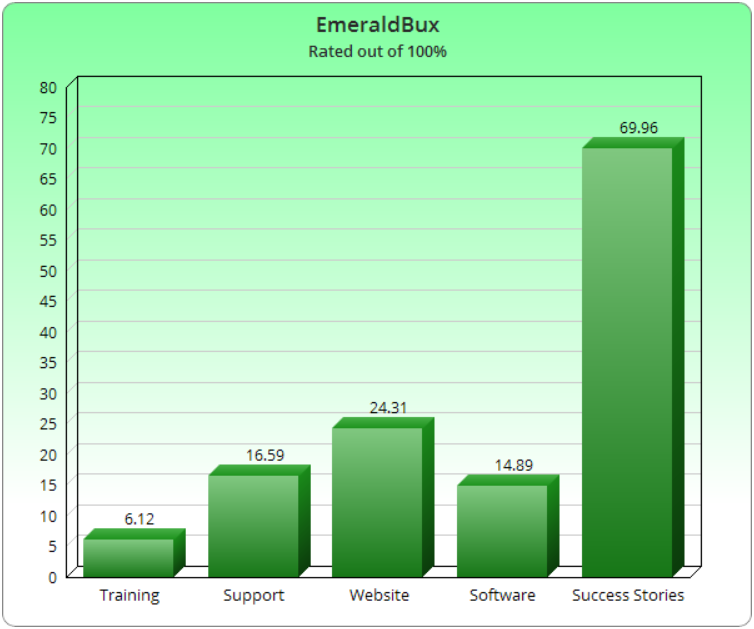 Owners of Emerald Bux will get majority of the payment through successful clicks made by every member. There has been over 50,000 members who have joined to the EmeraldBux program since it’s date of inception – 20th/MAR/2018. For those of you that already have an online business, or are contemplating starting one up. If you click on the ‘Advertise’ tab within EmeraldBux’s main menu. You are shown a page that explains how you can advertise on Emerald Bux to drive quality traffic over to your website. I’ll just stop that statement right there! Little does it say that the traffic sent to your website will be by people using Emerald Bux to generate income via clicks. These members are just here to just click on ads all day and night to earn revenue within there account. Returning to EmeraldBux to then click another ad, repeat the process until they reach the daily quota of clicks. So you would be only be looking at a few seconds, more or less. Um, that doesn’t exactly generate any real business Emerald Bux! 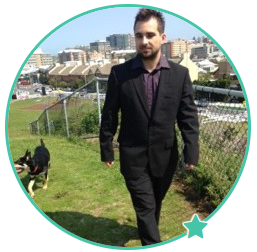 It also says that advertising on EmeraldBux will better your Alexa Rank score. This might be true to a certain extent, but deep down we both know that this isn’t genuine traffic seeking our help and services. You’d be practically gaming the Alexa Rank metrics if they are of any concern to you. Man, this site is a hoax! Here is why you need to understand companies like Emerald Bux are run by scam artists operating in secret behind the scenes. I need to try to explain the reality of this type of scam in simplest of terms. Probably unbeknown to you, kept hidden from all members using the EmeraldBux site. The idea of clicking on an ad to get paid online is real attractive concept, ask just about anyone and I am sure they would agree. So how is Emerald Bux a scam if some members are receiving payment? First we need to understand that just because Emerald Bux is doing the right thing by their members, in some cases. Doesn’t mean they are doing the ethical thing by Ad creators (small business owners/large corporations etc) advertising on online advertising agencies. Where do you think the money is coming from every time somebody clicks on these advertisements? Surely not out of EmeraldBux’s pocket! If you have had any experience using Google AdSense – Ad units that you can embed on a personal blog and/or affiliate website. You’d probably be aware that it is against AdSense policy to falsely click on your own ads displayed throughout your website. Doing so, and getting caught in the act can have your account terminated, with all earnings confiscated almost immediately! So how does this translate over to Emerald Bux you might ask. The answer is simple. Owners of Emerald Bux cannot sit around all day and night clicking on advert banners to derive income to their business. Why? Because there would be repeated clicks over and over again from a few IP addresses. Doing so would raise a few red flags. So instead, they lure in unsuspecting victims to do the dirty work for them. Thousands of people who are new or inexperienced to the idea of making money online (MMO) will by intrigued by the simplicity of clicking an add to get paid. It’s like some fishing line and bait as they easily capture a readers interest with the claim of earning income every time you click an ad. You are only allowed to click on about 4 ad units per day that count towards actual payments into your account. Which is a tell tale sign of minimising the amount of clicks performed by each individual IP address. Another thing EmeraldBux does not mention is that there are specific criteria that needs to be met before you can even withdraw earnings from your account. Which is why people end up leaving, therefore forfeiting there earnings in 30 days according to the terms of service. By the time you realise this is a scam. You will likely just leave and never come back without a second thought. Because it takes next to no time, no real effort invested to initiate a few clicks. Emerald Bux claims to have paid out €1017782.43 since the creation of this review. You can apparently cash out using PayPal, Payza, Payeer and Perfect Money sources. Earn illegitimate income by stealing from Ad creators. Very simple to earn revenue. Simple to understand and navigate throughout this shady site. It’s a fraudulent business practice. You’d be partaking in cyber criminal activity. If your account is inactive for ’30 days’ your account is destroyed, all earnings forfeited. You have to perform 100 clicks before withdrawing. Problem is, you can only perform 4 clicks per day. Taking 25 days! Otherwise, you have to upgrade. I really have no words to say about this business model. I guess we’ll just leave it at that then. If you proceed into this website there shouldn’t be any consequences on your behalf. If anyone gets caught here, it will be the creators of Emerald Bux. It really isn’t worth wasting the time here. Time is of the essence and could be spent learning and earning elsewhere. Maybe even how to build your own online asset, not contributing to EmeraldBux’s fishy asset. It’s that derelict you cannot find any business location details, website ownership info, social media profiles/pages. This reeks of a scam. If Emerald Bux was legit, one would imagine that these details should be proudly displayed on the website. Far out! Let me guide you to safety. 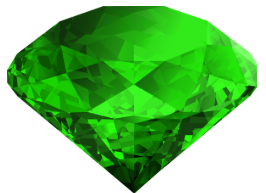 If you want to compare Emerald Bux with a legitimate opportunity, you can do so by reading this insightful thread. Just promise me you won’t go creating a website that replicates the behaviours of EmeraldBux please. So there you have it. A brief reason why you shouldn’t participate in EmeraldBux. Did you end up using this deceitful site and wanted to find out more about it today? Maybe you have a question. Submit any ideas below particularly if you are a previous user of the software. Love to hear your concerns about it. Be social and share if you found this article helpful.